Hello everyone! This is tyltalis, I've gone ahead and gotten a name change. I know a few of you have mistaken me for meowliz instead of meowllz (with two L's) so I thought it'd be much easier to contact me this way. Anyway, back to business! Today I'm bringing you a new member tutorial to try and help those who have just joined the community or have been lurking and are still on the fence about joining. I hope this helps out some of you who still have some questions or who are a little reluctant to make a post because you're a little unsure how to. In order to join the community, you must first make a Livejournal account. Signing up is simple and free, you can do so right here. Once you have made your account, you'll want to fill in some information about yourself. We would love a user picture and a journal entry or two to show you aren't a robot and it gives us a little more information about who you are. Membership to the community has to be approved by a moderator, so the more effort you put into your account the easier it is for us to approve you! After adding a user picture and a journal entry, head over to our Membership Post located in our general moderation's account journal. You can find the link below via the banner. You don't have to worry about anyone else seeing the comment you make there, as all comments are screened (meaning only authorized people, the mods, are able to view them! ), so try to add as many details as possible to your comment. We don't expect any 5 page essays, but a couple of sentences about who you are, what you collect or even your favorite Pokemon will do. When you first click the 'post to a journal' at the top of your LJ main page, it can look a little confusing if you don't know what you're looking at! There are two ways to post on LJ, one using HTML and the other is the visual editor. If you're unfamiliar with HTML the visual editor is a really big help. It works similar to sending an e-mail! There are two big things that most new members seem to forget when making their posts. One, is a Live Journal Cut and the other is our 500px by 500px wide rule for images. First we'll go over what an LJ cut is and how to use it. A Livejournal cut is an easy way to hide big images you want to post to the community without having them fill up our whole main page. Everything you put in between a cut will be hidden until someone clicks the link and 'opens' the cut. 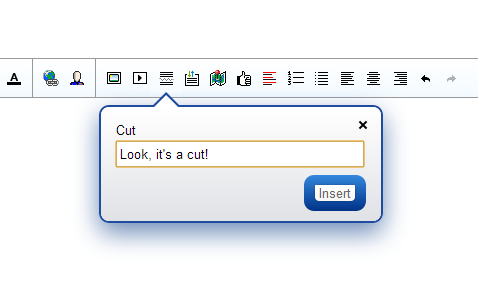 Here's how to insert an LJ cut using the Visual Editor. Once you have put in your flavor text for your cut, this is what it'll look like. Everything in between the two scissor pieces will be hidden until someone opens your cut. Everything outside the two will be seen by everyone! As said before, a cut is essential for hiding larger images or just a large amount of images. If you've got a whole box of stuff you've taken pictures of and want to show it off to all of us, put it behind a cut! That way the community page will load much faster (especially for people like me who have the slowest connection ever), and it'll make it easier for people to browse through all the posts! 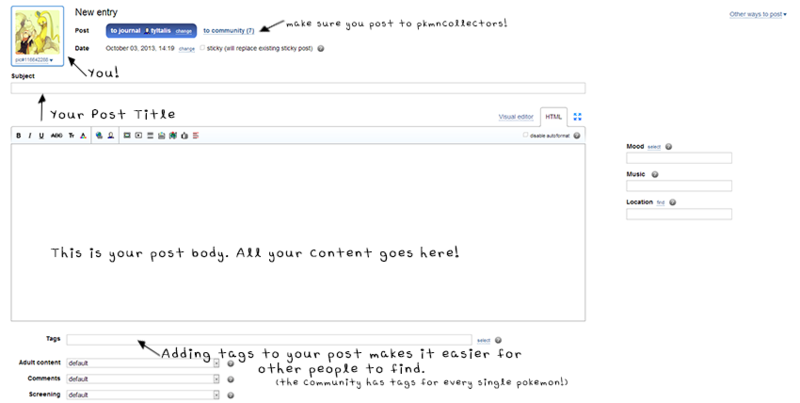 Once you've made your post to the community, here's how it should look. 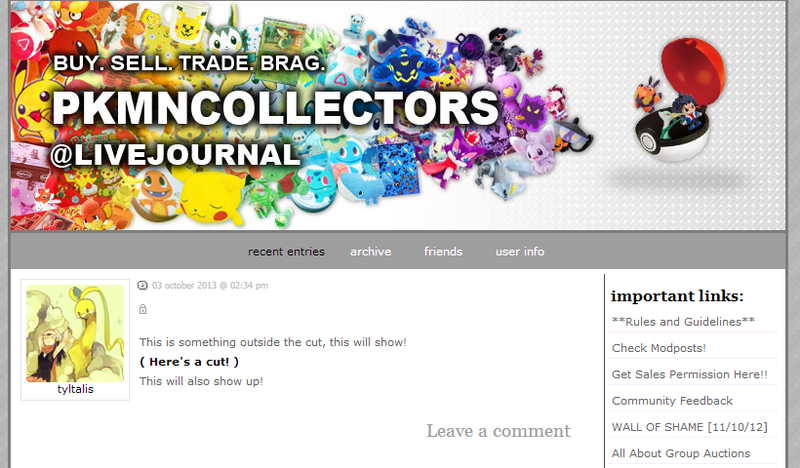 Note, when using the 'preview entry' button your LJ cut will not show up! Don't be alarmed, it's just LJ being stupid. Notice below how the image and the text we put in between the cut is now hidden! One big we need to talk about is images outside or inside your LJ cut. In accordance to our rules all images outside a cut must be, at most, 500px by 500px. This also goes together with another rule, that pictures may be no more than 1000 x 1000. When uploading images, please make sure they are no larget than this. Simply resizing an image that's 2.3MB and 2000 x 1500 doesn't help someone who has a slower connection. Resizing your pictures can be done easily in any image editing program such as paint. Alternatively, if you upload your images onto imgur they will automatically downsize to 1MB (5 if you're a registered user) so this is an alternative way to upload your images. There's also a lovely tutorial by one of our members located here about how to edit your pictures in paint! 1. 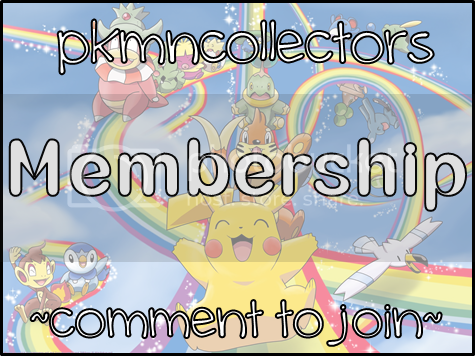 How can I get my own PKMNCollectors feedback page? A feedback page can be made here. A feedback page is required for trading and applying for sales permission, and it's a general tool for sellers on the community to see a buyers feedback. Our feedback system is to ensure you money or items are safe when buying, selling or trading in the community. Members with 3 negative feedback automatically have their sales permission suspended. 2. Do I need to have feedback to buy or trade? You can buy without feedback, but you need 10 positive feedback before you can trade with other members. 3. I just posted, but there's something else I want to say. What should I do? You can edit the post you just made and add the extra information, or, if there is enough content to warrant a new post, you can wait until is has been 24 hours since your last post and make a new post. Do not delete an old post to post a new one and do not post twice within 24 hours, unless the second post is about brand new merchandise that was just announced. 4. What are some good sites to buy official merchandise? Sunyshore is run by the creator of this community and usually features some of the latest merchandise coming out of Japan. Also, Poke-vault is run by Brian, though the prices can be a little more expensive he also sells 100% authentic pokemon merchandise. Finally, Animeraro is good for pre-ordering merchandise! Don't forget, a lot of people on this community also sell tons of stuff! 5. What is Yahoo! Japan and how do I buy things from it? Y!J is a Japanese auction site similar to Ebay, however, you'll need a deputy service in order to bid on items. There are several deputy services available including Shopping Mall Japan, Noppin, or Treasure Japan. There are many more services available, these are just a few. Remember, asking for a middleman from Japan is against the rules as there are many different ways to get items from Y!J. Pkmncollectors Rules - Use this for reference whenever you have a question about something. If something is unclear or not listed in the rules don't hesitate to contact a moderator! Moderator Contact Information - For all sorts of situations, please contact us! We don't get as many questions as you think. There are several ways listed in order to contact each one of us, so please do so. We don't bite, honest! How to Acquire Sales Permission - In order to sell on our community, you will need to apply and be approved for sales permission. This post will let you know everything you need and how to apply. Community Feedback System - You'll need feedback when trying to trade or to gain sales permission, so head on over and sign up. Our feedback system uses your LJ account name so leaving and receiving feedback is easy! More links can be found on our sidebar! Guides, tutorials and links to all posts above as well.